From Alaska Game Bags, we offer the Alaska Transport Bags. These bags are larger than standard meat transport bags and are made without a bottom seam and have closure ties sewn into the bags. They were specifically designed to accommodate the transport of whole animals such as deer or for large quarters from animals such as moose and elk. 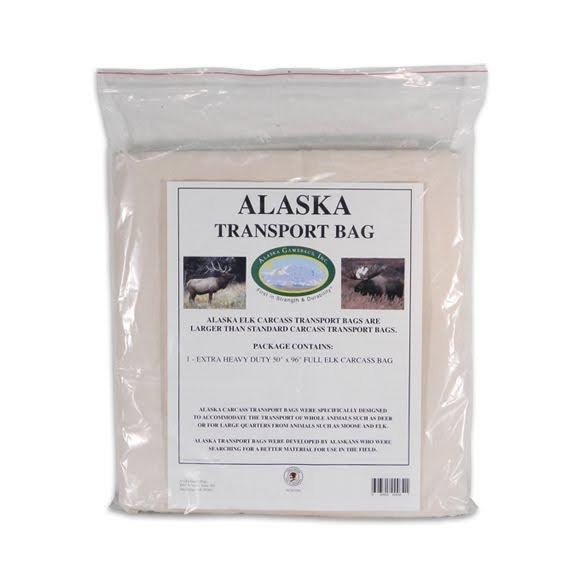 From Alaska Game Bags, we offer the Alaska Transport Bags. These bags are larger than standard meat transport bags and are made without a bottom seam and have closure ties sewn into the bags. They were specifically designed to accommodate the transport of whole animals such as deer or for large quarters from animals such as moose and elk. Comes with 1 extra heavy duty 50"x96" carcass bag and 1 hunter/recipient meat transfer form.